March 12, 2015 - "New Product Release"
TPC Wire & Cable Corp. is pleased to introduce Thermo-Trex® Chemical & Moisture Resistant Ultra-Sleeve™ with Closure, its new hook and loop cable sleeve intended for use to organize and protect cables against tearing, cut-through, abrasion, chemicals and moisture. TPC’s new wrap is constructed of a proprietary fabric that is resistant to puncture, tear, abrasion, water and petroleum. 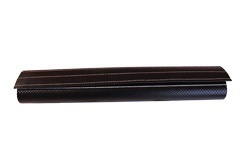 TPC Wire & Cable Corp., a leading supplier of wire, cable, connectors and assemblies is pleased to introduce a new cable sleeve designed with a proprietary fabric that is resistant to puncture, tear, abrasion, water and petroleum. Thermo-Trex® Chemical & Moisture Resistant wrap offers TPC customers a reusable sleeve that protects cable against tearing, cut-through and abrasion while offering excellent chemical and moisture resistance. Thermo-Trex® Chemical & Moisture Resistant Ultra-Sleeve™ with Closure is made from tightly woven ballistic Nylon® that sheds surface moisture and has a built-in industrial strength hook and loop closure. The easy, cut-and-wrap installation eliminates the need to disassemble existing components and reduces downtime. “Our new Thermo-Trex® Chemical & Moisture Resistant Ultra-Sleeve™ with Closure will work well for customers who are looking for an easy and durable solution for organizing and protecting their wire and cable from harsh environments,” said Debra Tromp, Product Manager at TPC. Thermo-Trex® Chemical & Moisture Resistant Ultra-Sleeve™ with Closure can benefit a variety of markets including food and beverage, oil and gas, transportation, mining, utilities, steel, medical and government facilities. About TPC Wire & Cable Corp.
TPC Wire & Cable Corp. is a leading supplier of wire, cable and connectors used in harsh industrial environments. TPC Wire & Cable’s products are designed and engineered to withstand harsh conditions including abrasion, chemicals, constant flexing and extreme temperatures. TPC serves a variety of markets including the steel, utility, mining, automotive, food and beverage, government, oil and gas, transportation and wood, pulp and paper markets. The company’s long-lasting, dependable wire and cable products solve the most difficult application problems in the harshest environments resulting in lower overall costs and increased production time. TPC products outperform and outlast ordinary cable 10:1. For more information about TPC Wire & Cable products, visit http://www.tpcwire.com.